Fernando Rizzato from Embarcadero has a blog post up with a pretty big add on for Delphi XE6 Firemonkey. The add on is Accessibility functionality on Windows and OSX. Accessibility allows your users to use screen readers with your application and it also allows some automated testing suites to also interact with your app. The Windows functionality uses MSAA (Microsoft Active Accessibility architecture) and on the Mac it uses the Protocol accessibility API. The way it works is there is a new TAccForm which derives from TForm and provides the accessibility functionality to child components on the form. Components that are automatically supported are TButton, TSpeedButton, TTracker, TEdit, TListBox, TComboBox, TComboEdit, TSpinBox, TLabel, TCheckBox, TRadioButton, TMainMenu, TMemo, TTreeView, and TCustomGrid. Additionally, it provides a special interface called IFMXAccessibility which you can implement in either your own components or third party components to enable accessibility in them. The accessibility functionality does not appear to extend to Android and IOS. The blog post is in Spanish so you’ll need to use Google Chrome to translate it (Google Translate can’t handle it). 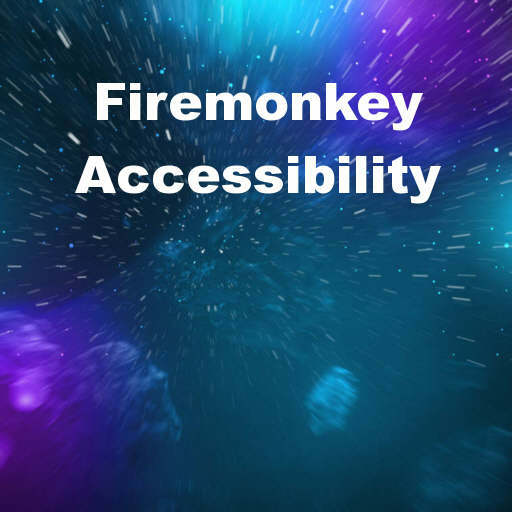 Head over and check out the full blog post about the accessibility addon for Delphi XE6 Firemonkey and then download it.